There are 7 reviews of Dark Saphir. After being disappointed by many of the 'knock them on the head and take no prisoners' type of oud frags, this is a welcome change. The oud makes its presence surreptitiously, cloaked by a gown of violet leaves, coriander, jasmine, geranium and a delicate rose (all 25 of the ingredients are listed on the package and bottle). After the dry-down, this lady (not a man, although it can be worn by both) sings a slow, mellifluous ballad, enticing the wearer with its repeated wafts of rose and herbs. High quality ingredients here (no plastic harps in this lullabye!). This is a seductive oud, that sneaks in rather than bang on the door. Definitely a keeper, Excellent silage and longevity (8 hours of sultry wafting). Ahh, a superb natural patchouli greets me, with a delightful purple violet not - like a more slim-line and elegant version of Tom Ford's Purple Patchouli's opening blast. Cumin and ginger abound, and a slightly peppery coriander - I get the drift: a somewhat somber and darkish but not inelegant spice mix. The drydown intercalated floral tones, especially nice geraniu and a darker black orchid impression, with the base adding a labdanum-olibanum component of rare quality, given more depth with a light and minimally sweet tonka not that is very deftly admixed to the spice potpourri. Still, throughout the development the patchouli remains in the foreground on my skin, the golden thread on this colourful olfactoric map. Dark Saphir opens with a boozy violet that quickly transitions into the all too familiar rose-patchouly-oud scent profile. The protagonist is the rose, however, but there is a myriad of notes present to support it. I particularly detect peach and raspberry, which make the rose come alive and not jammy. My favorite phase of the composition was the base when the ylang and labdanum become more apparent. This fragrance is somewhat reminiscent of Malle's Portrait of a Lady; and although the quality is good, it feels quite distant from POAL. Is it good? Yes. Is it original? No. What a horrible creation. Wearing this perfume(?) is far more difficult than describing it. Unstructured, flat, dull, zero personality and full of natural ingredients(? ), that in this blend smell too chemical. It smells like: 1) very cheap ginger-ale, 2) a homemade scroppino which got the ratio's all wrong, 3) sour lemon-sorbet 4), the inside of a new plastic bag, and 5) the flint of a disposable lighter; firmly pressed together and cranked up to a high volume-level that altogether gives Dark Saphir a penetrant and musty sour-bitter taste of smell, that is hard to bare for my nose. Sweden is a land renown for its reliable made products with a great feel of design; this thing manages to impart none of those qualities. 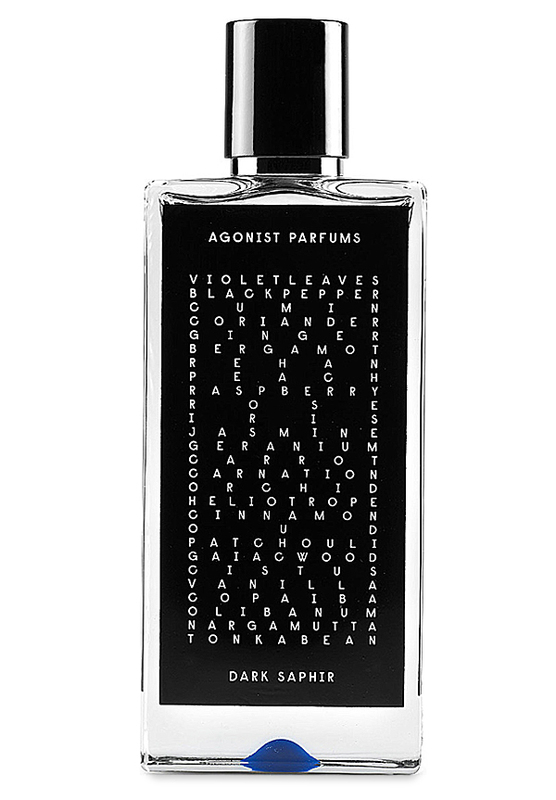 I don’t hope that Dark Saphir sets the tone for the whole range of the Agonist-product line. Unskillful made perfume. There are no member images of Dark Saphir yet. Why not be the first?